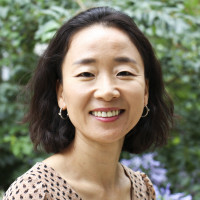 Haesuk Park, Ph.D., is an Assistant Professor in the Department of Pharmaceutical Outcomes and Policy. She received her Bachelor and Master in Pharmacy from South Korea, and her Ph.D. at The University of Texas at Austin, College of Pharmacy, Health Outcomes & Pharmacy Practice. Her research centers on economic and health outcomes studies of medications and pharmaceutical care services as well as policy associated with the use of pharmaceuticals. She is passionate about investigating questions related to health policy in vulnerable populations and, particularly, how a policy affects access to care, the quality and cost of health care, and ultimately health outcomes. In recent years, the clinical focus of her research has centered on patients with hepatitis C virus (HCV) infection, a research area with growing intensity and breadth due to the increasing awareness of the disease burden and the continuing development of new treatments. In 2018, Park received a 5-year NIH/National Institute on Drug Abuse (NIDA) K01 to build a research program in the area of HCV and health policy for individuals with substance use disorders. Currently, she also collaborated on a NIH/NHLBI R01 project to evaluate the impact of the pharmacist-led telehealthcare medication therapy management to change health outcomes in adolescents and young adults with asthma (MATCH). Her research has received a number of awards and recognition by the professional community such as the Best New Investigator Presentation Award at the International Society for Pharmaceutical Outcomes Research (ISPOR), Best Paper Award in the Economic, Social & Administrative Sciences at the American Pharmacists Association (APhA) Annual Meeting, and the 2015 University of Florida Excellence Award for Assistant Professors. Park H, Chen C, Henry L, Wang W, Cook R, Nelson D. Hepatitis C Virus Infection Increases the Risk of Chronic Kidney Disease (CKD) while Effective HCV Treatment Decreases the Incidence of CKD. Hepatology 2017 DOI: 10.1002/hep.29505 *Selected for editorial highlights.